Just a few photos from the recent Laos New Year (Pi Mai Lao), a holiday called Songkran in Thailand, where there are huge waterfights to mark the three-day event. Here in the village, the water throwing was much more subdued than elsewhere. Most people ask first if they can pour cold water down your back in a ritual cleansing, so to speak. It can get a bit out of hand, with water being slung about to include any bystanders, but it’s nothing like in Bangkok or even Vientiane, where there were some large-scale water fights on the main streets. 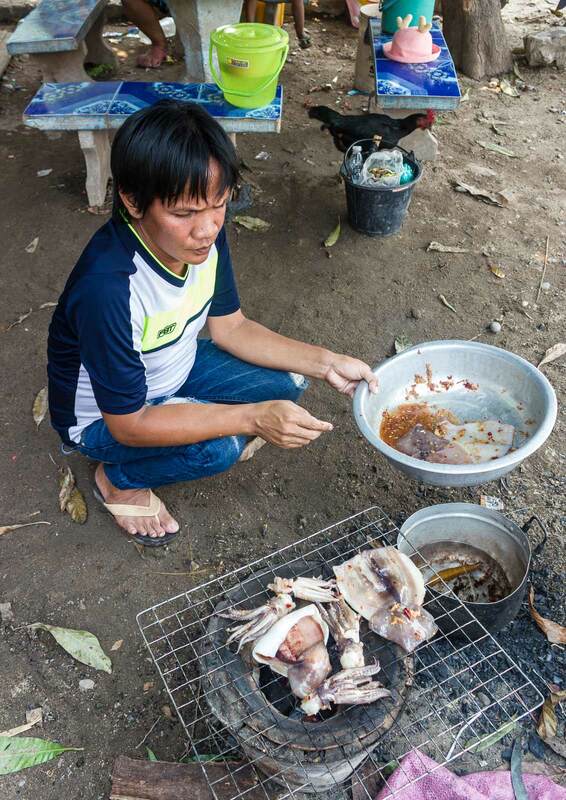 It’s also a religious celebration, where Buddhists go to their local temple and cleanse the Buddha statues, and it’s a time for house cleaning. Most people will do a thorough cleaning of their homes, sweeping, mopping, dusting and even a bit of painting to spruce the place up. There were a few parties at Nai’s family compound, just a five-minute walk from where we live. 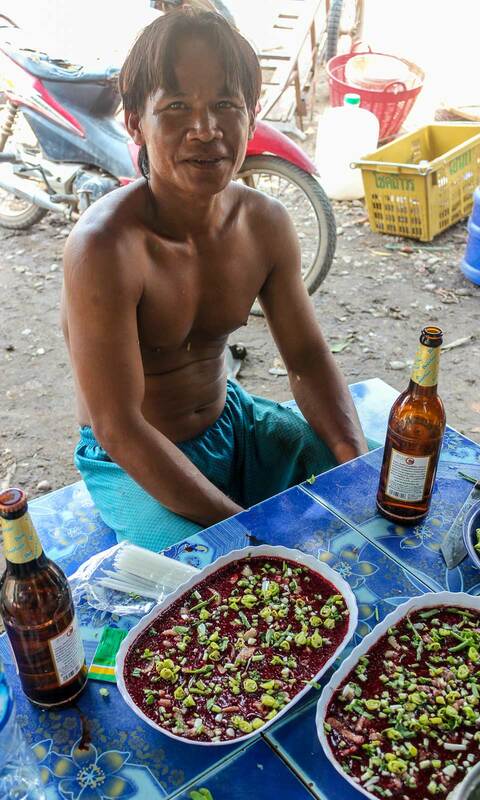 Lots of food, beer and loud music (too loud). And fun. P.S. I’m just now getting this posted due to a couple of factors. First, I couldn’t get any posting done at the farm because of the extremely crappy internet connection. Finally, the new school term started, so I can make use of the school internet, which is mostly…hmmm, just OK, I suppose, but it works. However, I’m teaching on a full-time basis this term, six days a week, so I’ve been quite busy at the start. I’m finally up to par on everything, so I’m able to get this up today. Enjoy. More later. Nai’s niece, Seo (pronounced, approximately, Saw) tends to some grilled duck. 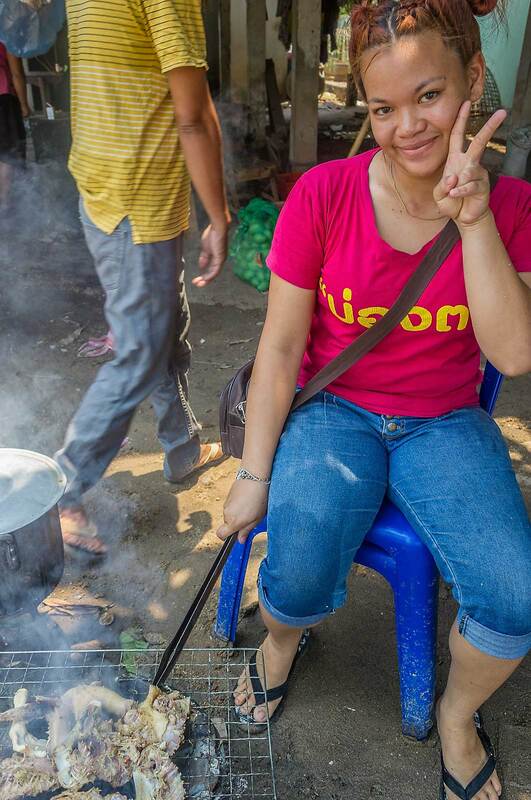 She and her husband, Khoon, live not too far from Vientiane. The duck’s grilling and it’s just the start of all the food that’ll be eaten today. 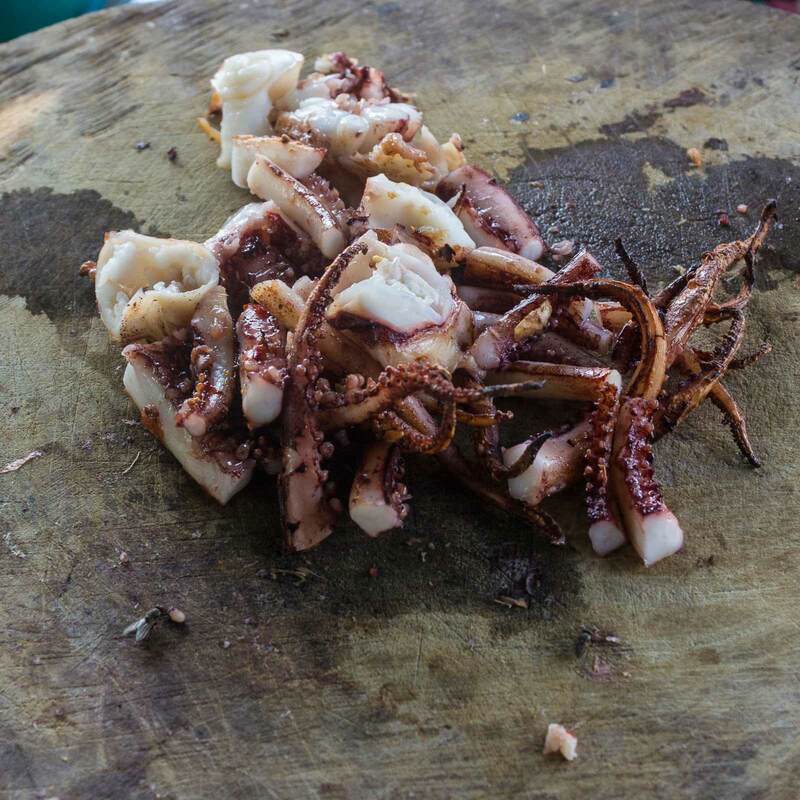 Squid, cut up and almost ready to grill over an open fire. I don’t much care for it, so I’ll wait for the grilled fish. Now it’s ready to grill, after marinating in a spicy chili sauce for a few minutes. Too hot for my taste buds. 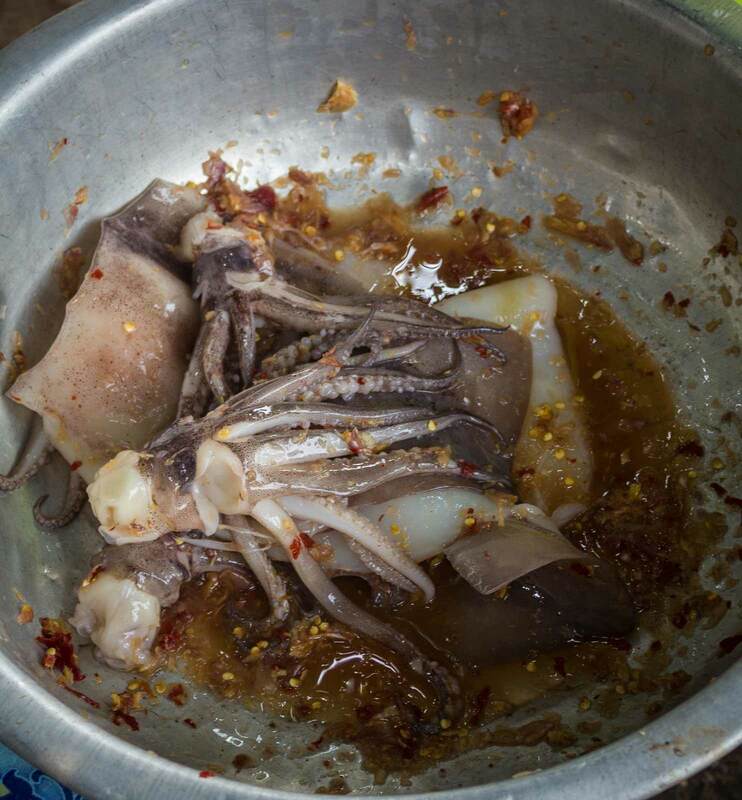 Nai takes charge of grilling the squid. He’ll end up eating the most, since he loves it. 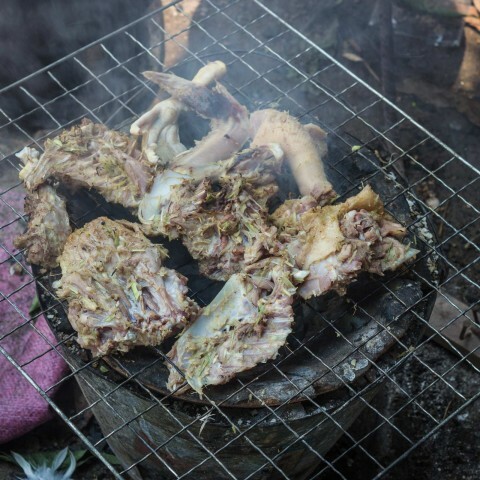 It’s finally been grilled and cut into pieces. Ready to eat! Nai’s sister, Awl, enjoys some of the squid. She’d better get her share before Nai starts digging in. 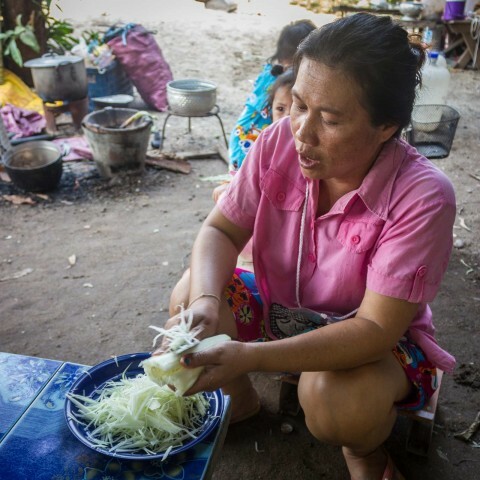 One of Nai’s numerous cousins shreds raw papaya in preparation for making another staple, papaya salad. 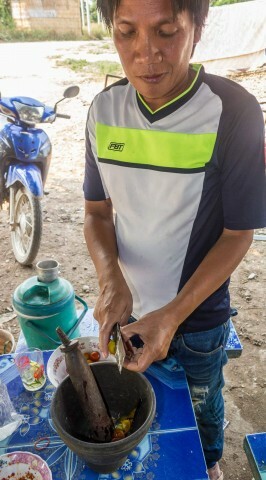 Nai prepares the extremely spicy hot fixings that the papaya goes into. 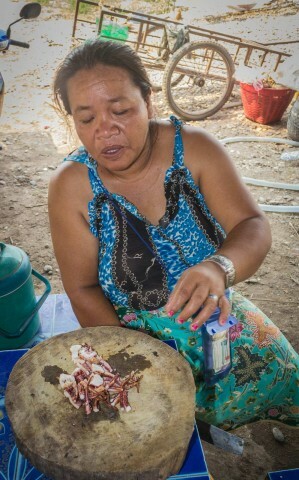 The mixture includes very hot chili peppers (the more, the better), tomatoes, lime juice and a fermented fish paste, which looks just awful. This concoction, when mixed with the papaya , is extremely hot, much too fiery for me. I nibble a little, but I soon rush to find some cold water. Whew! 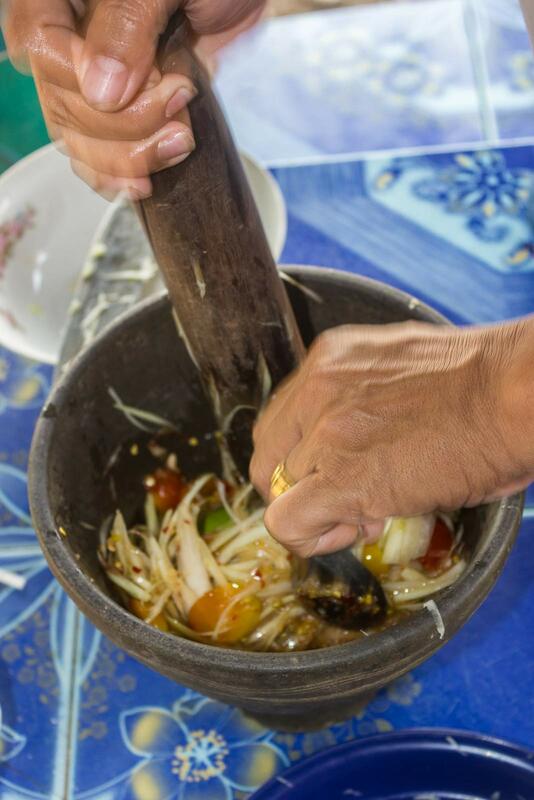 Here, Nai uses a mortar and pestle to mix all the ingredients together. Next stop, mouth. 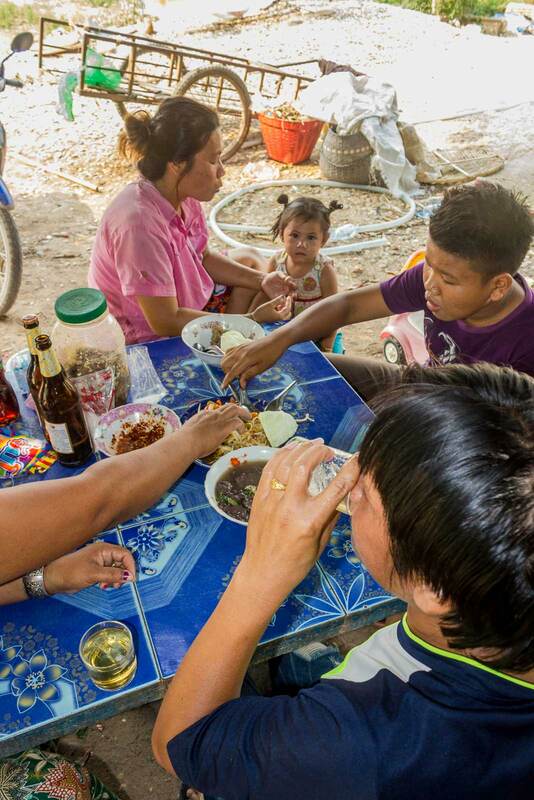 And, finally, everyone (except me) enjoys the papaya salad. I don’t know how they can eat something this hot and be so nonchalant about it. I guess it comes from a lifetime of eating it. Bon apetite. Now this is more like it. 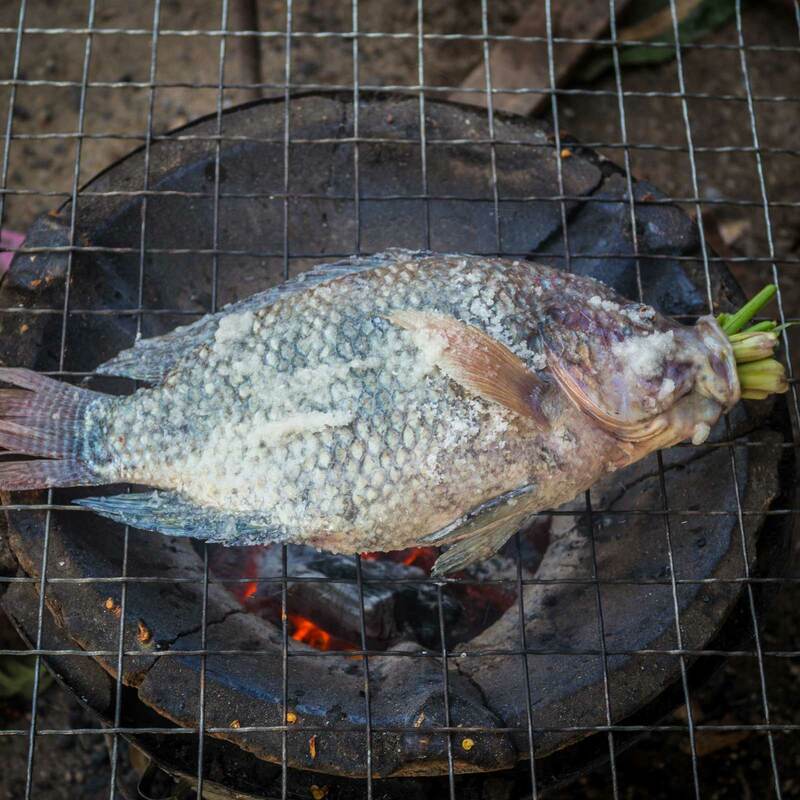 I love this fresh fish from the Mekong, grilled over a charcoal flame and stuffed with a few herbs. Simply delicious. These cost about 25,000 kips each, around $3. Nai’s brother, Guay, enjoys a couple of beers with some duck blood soup, kind of a staple (both beer and soup) on Pi Mai Lao. 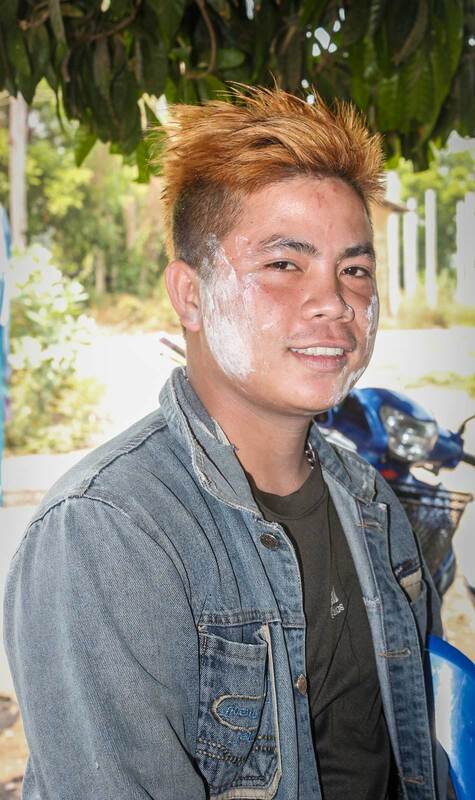 Khoon, Seo’s husband, has been out running around the village, meeting friends, drinking beer, and getting his face coated with baby powder, another Pi Mai Lao tradition. 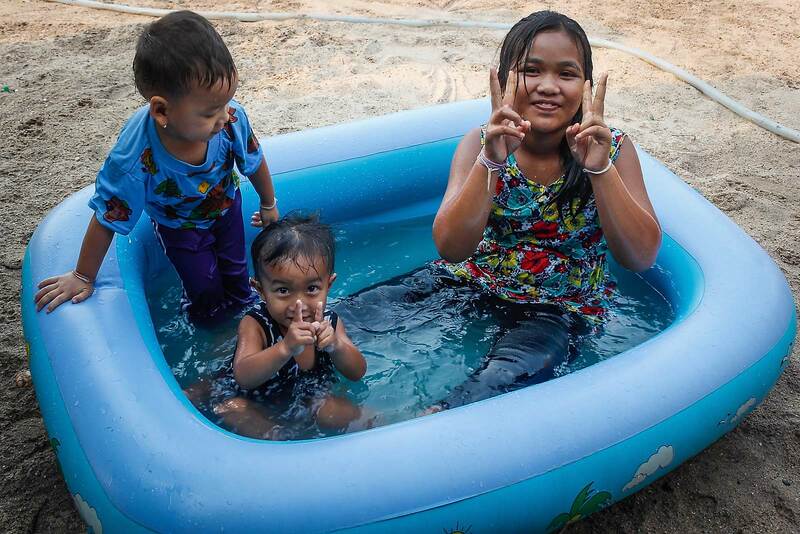 It’s been very hot lately, so what better way for the kids to cool off than to hop in a small wading pool. The boy in front on the left is Leo, Nai’s two-year old nephew. Whenever he sees me taking photos, he makes this little square with his hands, which represents the camera, I suppose. He’s quite a ham. To his left is Guay’s daughter, Muoy. I’m not sure who the boy is in the back, just that it’s another one of the cousins. This is Pang showing obeisance to her mother, Awl, by washing her feet at the end of the day. When she finished the washing, she bowed down and placed her mother’s feet on the top of her head to show further respect. She did the same for her father’s feet. 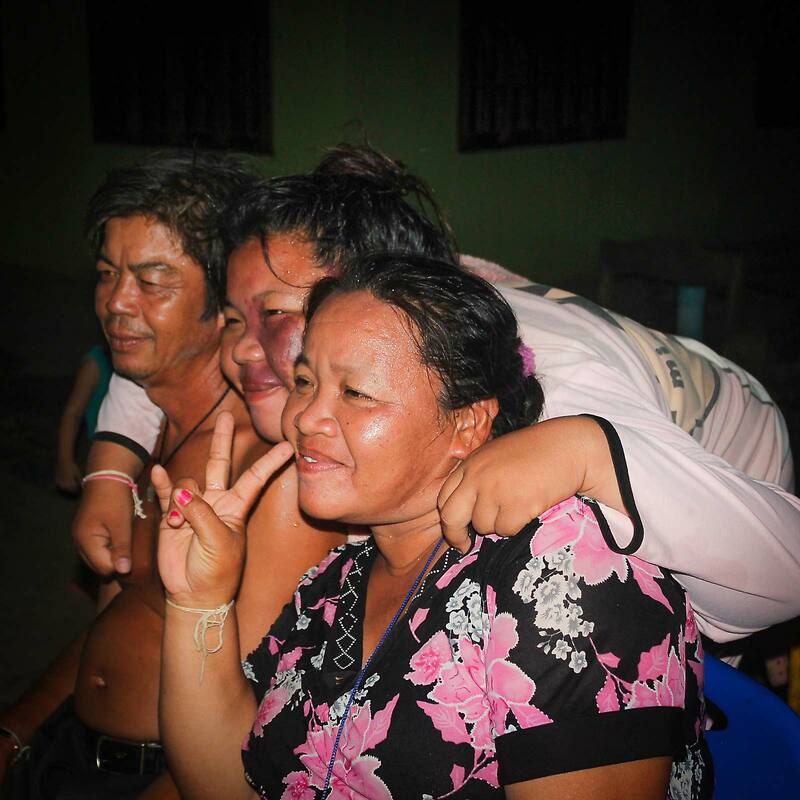 Gaith, Pang’s father, and Awl enjoying the end of the day. I think the look on Gaith’s face was caused by little Leo, his grandson, pouring some ice water down his pants. Gaith and Awl enjoy a happy moment. I love Awl’s smile. Gaith, Pang and Awl pose for a photo. The end of a long day for everyone. Bedtime.